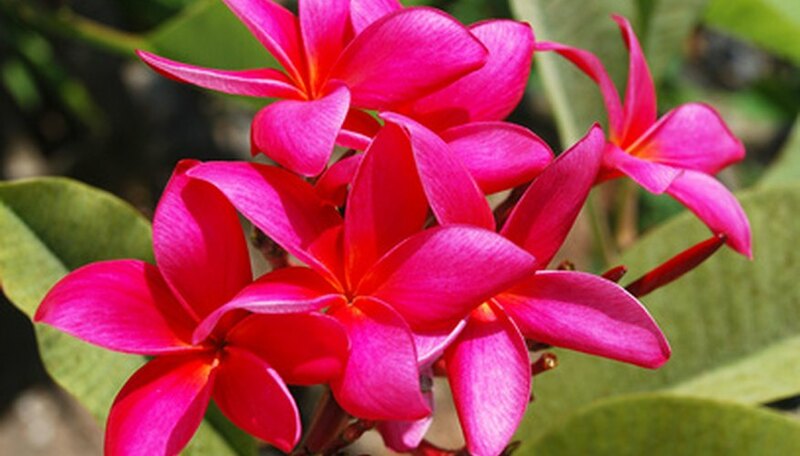 Plumerias are sometimes known as temple trees and frangipani. Although the majority of plumerias are indigenous to the Caribbean and Central America, they are grown in tropical climates throughout the world. Plumerias can be grown as trees or large shrubs, depending on the variety. They produce highly coveted, wax-like fragrant flowers that are used in creating leis, the floral necklaces of Hawaii. Plumeria cuttings are best planted in spring or early summer for optimum root establishment. Cut off 12- to 18-inch-long sections from a healthy, growing plumeria plant. Look for hardy-looking stems with plenty of growth. Make sure you cut the sections off at an angle. If you are going to collect more than one plumeria cutting, the Plumeria Society recommends you sterilize the cutting instrument with rubbing alcohol to prevent the spread of pathogens. Cut off all the leaves to about halfway down each stem section. Cut the remaining leaves in half to help eliminate any moisture loss while the cuttings root. Place each of the cuttings in a dry, warm location in your home to allow the waxy sap to dry from the cut end of each cutting. Let the cuttings dry approximately one week. Fill up 1-gallon or 6-inch-wide plastic pots with either fine sand or a soilless potting mix that contains perlite. Measure out approximately 2 to 3 tbsp. of a rooting hormone powder that also contains fungicide onto a sheet of paper. Dip the cut end of each plumeria cutting into approximately 1 inch of the rooting hormone powder. Gently tap the cutting to shake off the excess powder. Poke a 1- to 1 1/2-inch-deep hole in each of the pots. Try to place the hole near the edge of each pot so the cutting will have support. Place the plumeria cutting carefully into the hole. Pinch the soil in and around the cutting. Place the pots of plumeria cuttings in a location that will give them full sunlight. Bottom heat will hasten root formation. A good place to situate the pots is on sun-warmed concrete, as suggested by the Plumeria Society. Water the plumeria cuttings sparingly but never allow the soil in the pots to completely dry out. Watch for new growth to begin forming on the cuttings in approximately six to eight weeks. Avoid bumping or moving the pots while the cuttings take root. Any disturbance can prevent the cuttings from taking root. Plumerias are not hardy to cool temperatures whatsoever. They require a frost-free environment year-round and will drop their leaves if the temperature falls below 50 degrees Fahrenheit.